Availability: Pre-Order Special, Download this Sunday. 3. What’s in your library? Theology 101, Part 5: Salvation The Tongue and Speaking in Tongues - Studying Important Doctrine, Part 4/12 Calvinism vs. Arminianism, Part 1/6 Biblical Leadership: What is the Biblical Church Leadership Model? I was able to download the software with no problem. I'm looking forward to Part 2. 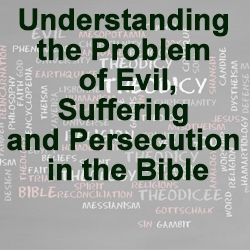 A superb research guide for engaging the mystery of Evil's existence in the presence of an omnipotent and all-loving God. This was a very helpful study on evil. This will help me as I teach apologetics in small groups. Many people wrestle with this in their personal lives. The many resources you mentioned on this topic will definitely help me. Also, I really like the the collection you taught how to build for our library. Thanks for a great teaching. Once again John has presented a webinar that provides the participant with priceless information on how to find the information to formulate answers to the questions they have. Not the answers themselves, but the most effective use of the resources they have to put together a foundation for themselves and information to share with others as well so that they may make some sense out of the things in life that just don't make sense: pain, suffering and evil. I truly appreciate the way John instructs as it makes no assumptions about the student and yet provides education that works for all levels of students. By focusing on one topic for each webinar and exploring the options in using available resources, a person will derive the most understanding on the subject which can given in the time allotted. Another excellent and edifying hour and a half spent with you, John. Thank you.